The Centre said his appointment may not be 'appropriate'. 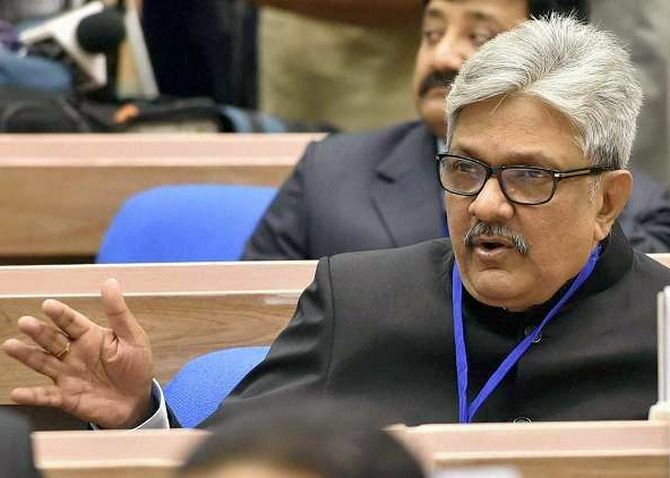 In a fresh confrontation with the judiciary, the government on Thursday told the Supreme Court collegium to reconsider its proposal to appoint Uttarakhand high court Chief Justice K M Joseph to the top court, saying the elevation may not be 'appropriate'. The government received immediate support from the collegium head, Chief Justice Dipak Misra, who said the executive was well within its rights to reject Justice Joseph's name while accepting the second name -- of senior lawyer Indu Malhotra -- even though both were recommended for elevation together by the collegium. The names of Malhotra and Justice Joseph were recommended by the collegium in January. In a letter to Justice Misra, Law Minister Ravi Shankar Prasad said the government's rejection of Justice Joseph's name has approval of the President and the prime minister and also flagged that the SCs/STs have no representation in the Supreme Court since long. 'The proposed appointment of .... Joseph as a Judge of the Supreme Court at this stage does not appear to be appropriate,' Prasad said in the letter. 'It would also not be fair and justified to other more senior, suitable and deserving Chief Justices' and senior judges of various high courts. In theory, the collegium can still reject the government's proposal and resend Justice Joseph's name to the law ministry, which can then decide the future action. The government's opposition to Justice Joseph's elevation is likely to deepen the rift between the executive and the judiciary. In a ruling in 2016, Justice Joseph had cancelled President's rule in Uttarakhand and brought back to power the then Congress government of Harish Rawat in the state. The judgment was seen at that time as a major setback to the Bharatiya Janata Party-ruled government at the Centre. The government's decision against Justice Joseph's elevation evoked sharp reactions with the Supreme Court Bar Association President terming it as 'disturbing' and the main opposition party, Congress, asserting that the independence of the judiciary "is in danger" and asking if it would now speak in one voice that 'enough is enough'. '...the government has been constrained to segregate the recommendation of the Supreme Court...such segregation of proposals has been done in many cases earlier, which include appointment of judges to various HCs and even the SC in the interest of expeditious action on appointments,' Prasad told Justice Misra. In June 2014, the then Chief Justice of India R M Lodha had written to the government making it clear that the executive cannot segregate recommendations without prior approval of the collegium. This had happened when the government had had decided against elevating senior lawyer and former solicitor general Gopal Subramanium to the Supreme Court, while accepting other recommendations of the collegium, a group of senior-most judges of the Supreme Court that decides on appointment of the apex court judges. But in the meantime, Subramanium withdrew his consent to be recommended for the judgeship. In his six-page letter on Thursday morning, Prasad said in the all-India high court judges seniority list, Justice Joseph is placed at serial number 42. 'There are presently 11 chief justices of various high courts who are senior to him in the all-India high court judges seniority list,' he said. Out of a sanctioned strength of 1,079 judges, the 24 HCs have 669 judges. Noting that the parent high court of Justice Joseph, the Kerala high court, has adequate representation in the Supreme Court and other high courts, Prasad said the high courts of Calcutta, Chhattisgarh, Gujarat, Rajasthan, Jharkhand, Jammu and Kashmir, Uttarakhand, Sikkim, Maniur and Meghalaya have no representation in the top court. 'It may be relevant to mention here that there is no representation of SCs/STs in the Supreme Court since long,' the letter read. Quoting two Supreme Court judgments, the letter also said that senior HC judges should entertain hopes of elevation to the SC and the CJI and the collegium should bear this in mind. While recommending the name of Justice Joseph for the top court, the collegium had said that he is 'more deserving and suitable in all respects than other chief justices and senior puisne judges of high courts for being appointed as judge of the Supreme Court of India'. The collegium had taken into consideration combined seniority on all-India basis of chief justices and senior puisne judges of high courts, apart from their merit and integrity, the body of top five judges of the Supreme Court had said. But government sources said the 'campaign' to project Justice Joseph as a victim of the order was 'disturbing'. "It is baseless... Justice J S Khehar struck down the National Judicial Appointments Commission Act. He was appointed as the CJI," they pointed out. Activist lawyer Prashant Bhushan shared the views of senior advocate Vikas Singh, the Supreme Court Bar Association President, even as BJP leader Subramanian Swamy, a regular petitioner in the apex court, said the Congress' stand on the issue reflected its frustration. Swamy's comment assumes significance as the Congress leadership including P Chidambaram, himself a senior advocate, were critical of the Centre's decision and tweeted that the recommendation of the collegium was final and binding in the appointment of judges. Why are judges' disputes coming out in the open? What did the judges achieve?